Situated in downtown Toronto, the Art Gallery of Ontario (AGO) is the 8th largest Art Gallery in North America. It recently underwent a $276 million transformation that included over 280,000 sq.ft. of renovated and newly built space designed by Frank Gehry, the well known architect of the Guggenheim Museum Bilbao. Barwood Flooring won the contract to install the hardwood floors found throughout the space using Fortane LD™ Wood Flooring Urethane Adhesive. For the AGO project, Barwood installed 1/2″ x 5″ engineered white oak plank for a timeless look with a contemporary edge. The project specs called for the floor to be laid with a urethane adhesive that contained no water, such as Fortane LD™. Barwood Flooring is one of the largest retail/wholesale distributors of hardwood flooring and accessories in Southern Ontario. Located in North Toronto, Barwood boasts a staff of over 100, including a team of skilled flooring professionals for retail, commercial, residential, sports and restoration flooring installations. With a reputation for quality, reliability and expertise, Barwood has won the flooring contracts on dozens of high profile projects including notable landmarks such as the Royal York Hotel, Queen’s Park (Ontario’s government buildings), the National Ballet of Canada and the recent transformation of the Art Gallery of Ontario(AGO). Vito Di Franco is the owner of Barwood Flooring. As a successful businessman with a reputation to uphold, his biggest everyday concerns are: having supplies on hand, quality of the material, quality of the workmanship, and the profitability of each project. With Fortane™ Wood Flooring Adhesive Systems, he never has to worry about these issues. “Profitability is not just about the price of the product, you have to factor in the call backs…There are cheaper products out there, but it’s not worth taking the chance.” The task of laying the floors in the AGO took almost 6 months. But with another product it could have taken much longer. 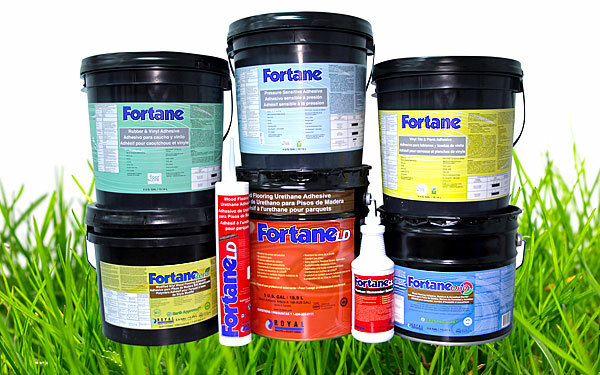 Fortane™’s easy to spread formula kept the project on track and on budget allowing the installers to concentrate on their overall workmanship and making sure the job got done right the first time.